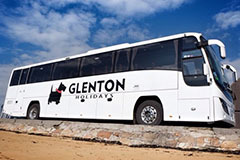 Travel in style with Glenton Holidays departing from your local pickup points in Scotland and enjoy exelent service from one of the most experienced coach holidays specialist in the UK. Glenton is located in Scotland and offers fantastic package holidays and tours throughout Britain, Ireland and Europe. Save an extra 3%* on Glenton Holidays by booking with us! Glenton - Doing Things a Bit Differently! Glenton Holidays are Scotland's premier ABTA bonded, ATOL protected Tour Operator for the over 55's. They provide Coach, Air and Cruise holidays with convenient pick up points throughout Scotland and proudly lead the way in coach holidays, listening to customers and doing things a bit differently. All Glenton coach holidays (and many of our cruise & air holidays) include a free holiday insurance option. There are no age restrictions and in most instances you do not need to declare pre-existing medical conditions. It’s all part of the Glenton services that makes us stand out from the crowd. All our coaches are modern vehicles delivering the highest levels of comfort and safety. Upgrade to our “Select” holiday collection to travel in style in our state-of-the-art luxury coaches with more leg room, reclining seats, panoramic windows and a premium welcome pack. Glenton holidays offer a selection of hosted holidays. Our Good Companions collection is designed for the mature solo traveller. Relax with confidence in the company of likeminded people doing exactly the same as you – exploring new places and having fun with new friends. *3% discount applies to holidays of £150 or more per person.